Starting with Pega® Platform 7.3.1, you can use multiple versions of a single Decision Data Store (DDS) data set in different application versions that run on the same Pega Platform instance. You can efficiently move records between those versions, without losing any data in the process, even if the underlying data schema is different. To create a Decision Data Store data set version, you can use the Save As option on the data set rule form. When creating a version of an existing data set, you can define a new set of exposed properties. However, you cannot modify the data set keys. If sibling DDS data sets belong to different versions of the same ruleset (for example, PegaBank:01-01-01 and PegaBank:01-01-02) and their data schemas are different. Data migration is not possible if sibling data sets share a data schema. If sibling DDS data sets belong to different rulesets, for example, PegaBank and PegaBankInt. A sibling rule is a corresponding rule in another version of the same ruleset or a rule that has the same name and Applies To class but is part of a different ruleset. To find sibling rules of the rule that you are currently working on, on the data set rule form, click Actions > View Siblings. Truncate the source data set after migration. Use this option if you do not need the data in the source data set, for example, because it is part of an obsolete ruleset. Truncate the destination data set before migration. Use this option, for example, if you want to clear corrupt or obsolete data from the destination data set before migrating. When you start the migration, a data flow run starts in the background of your application. You can see the migration progress by clicking Open data flow run. 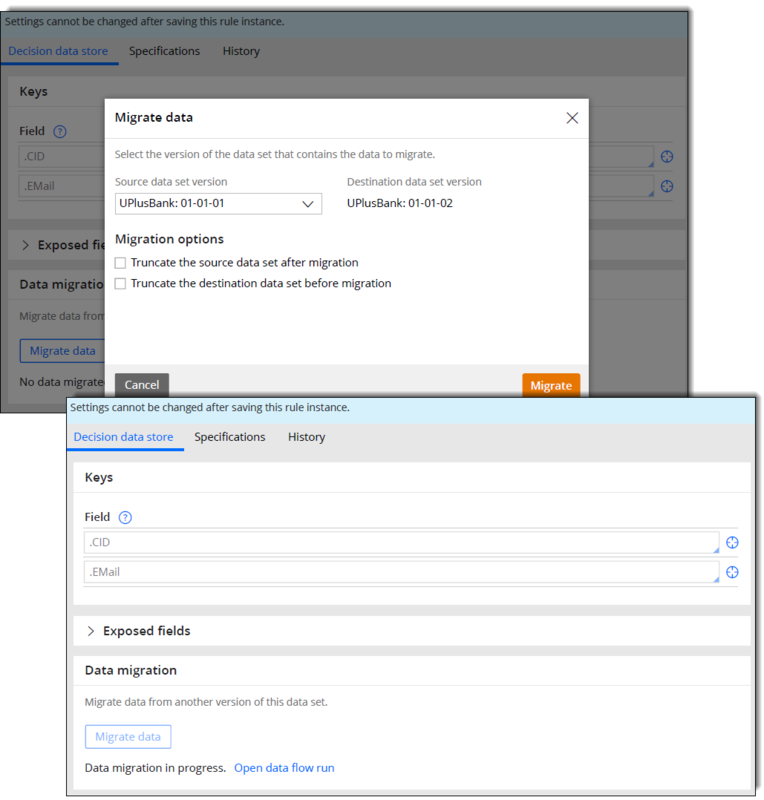 The migration mechanism prevents any loss of data, even if you migrate data between data sets that have different data schemas.